The complex includes the Pioneer Deep Space Station (aka DSS 11), which is a U.S. National Historic Landmark. The current communications complex is one of three in the NASA Deep Space Network (DSN), the others being the Madrid Deep Space Communications Complex in Spain and the Canberra Deep Space Communication Complex in Australia. Five large parabolic ("dish") antennas are located at the Goldstone site to handle the workload, since at any given time the DSN is responsible for maintaining communication with up to 30 spacecraft. The antennas function similarly to a home satellite dish. However, since the spacecraft they communicate with are much further away than the communication satellites which home satellite dishes use, the signals received are much weaker, requiring a larger aperture antenna to gather enough radio energy to make them intelligible. The largest, a 70-meter (230 ft) Cassegrain antenna, is used for communication with space missions to the outer planets, such as the Voyager spacecraft, which, at 21.5 billion kilometers, is the most distant manmade object from Earth. The radio frequencies used for spacecraft communication are in the microwave part of the radio spectrum; S band (2.29 - 2.30 GHz), X band (8.40 - 8.50 GHz) and Ka band (31.8 - 32.3 GHz). In addition to receiving radio signals from the spacecraft (downlink signals), the antennas also transmit commands to the spacecraft (uplink signals) with high power radio transmitters powered by klystron tubes. A major goal in the design of the station is to reduce interference with the weak incoming downlink radio signals by natural and manmade radio noise. 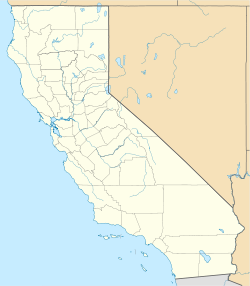 The remote Mojave Desert location was chosen because it is far from manmade sources of radio noise such as motor vehicles. The RF front ends of the radio receivers at the dishes use ruby masers, consisting of a bar of synthetic ruby cooled by liquid helium to 4.5 K to minimize the noise introduced by the electronics. 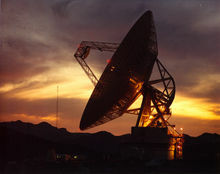 When not needed for spacecraft communication, the Goldstone antennas are used as sensitive radio telescopes for astronomical research, such as mapping quasars and other celestial radio sources; radar mapping planets, the Moon, comets and asteroids; spotting comets and asteroids with the potential to strike Earth; and the search for ultra-high energy neutrino interactions in the Moon by using large-aperture radio antennas. DSS 13 - "Venus" 34m Beam waveguide antenna (BWG) on altazimuth mount, located in Venus, California. ~910 m² aperture. DSS 14 - "Mars" 70m Cassegrain reflector on Alt/Az mount. ~3850 m² aperture. The Goldstone complex was created in 1958 by the JPL to support the Pioneer program of deep space exploration probes. Its location was determined by two criteria: a bowl-shaped environment was needed, and it needed to be distant from terrestrial sources of radio interference. This site, on the grounds of Fort Irwin in the Mojave Desert, was found to meet the criteria. Construction of the first radio telescope, DSS 11 or the Pioneer Deep Space Station, was begun by the United States Army and taken over by NASA after its creation. It is a 26-metre (85 ft) parabolic Cassegrain antenna capable of receiving signals in the 1 to 3 GHz range. It was taken out of service in 1981, having been technologically bypassed by later telescopes. It was recognized as a National Historic Landmark in 1985 for its pioneering role in deep space exploration. It is commonly believed that the first American satellite, Explorer 1, was confirmed to be in orbit by the use of the phrase "Goldstone has the bird". However, Goldstone was not in operation at the time of Explorer 1, and like many oft-repeated quotations it is incorrect. Others claim that the actual phrase was "Gold has it! ", incorrectly identifying "Gold" as a temporary tracking station at Earthquake Valley, east of Julian, California. In fact, Gold Station was located at the Air Force Missile Test Center (AFMTC) in Florida and the temporary tracking station at Earthquake Valley was Red Station. Probably this detection of the Explorer 1 signal was actually made at the Minitrack station at Brown Field, a US Navy airfield near San Diego. This station was later moved to Goldstone, accounting for the error. The Goldstone Deep Space Communications Complex no longer offers tours for the public. However, there is a Visitor Center located in Harvey House, 681 North First Avenue Barstow, CA 92311. The DSS 14, "Mars" telescope is specifically quoted in the webcomic Wondermark, episode 881 "In which a Standard is Questioned". ^ "Apollo Deep Space Station". National Historic Landmark summary listing. National Park Service. Archived from the original on 2007-07-01. Retrieved 2008-03-20. ^ "A Search for Ultra-High Energy Neutrino Interactions in the Moon Using Large-Aperture Radio Antennas". University of California, Los Angeles. Retrieved 2008-03-28. ^ "NHL nomination for Pioneer Deep Space Station". National Park Service. Retrieved 2018-02-01. ^ "History of GDSCC". NASA. Retrieved 2018-02-01. ^ Medaris, John B. (1960). Countdown for Decision. New York, New York: G. P. Putnam & Sons. ISBN 978-1124155661. ^ David Malki (c). Wondermark. (). October 23rd, 2012, . Wikimedia Commons has media related to Goldstone Deep Space Communications Complex.